Everyday Artist: Hotel del Coronado Sketch - Finished! Hotel del Coronado Sketch - Finished! In my previous post, I showed you several color options for the title lettering on my unfinished sketch of Hotel del Coronado and asked which you thought worked best. I received lots of comments both here on my blog and on a Facebook group that I participate in and could tell you all put a lot of thought into your answers. and here are the color options I was trying to decide between...red, blue-violet, peach, or olive green. 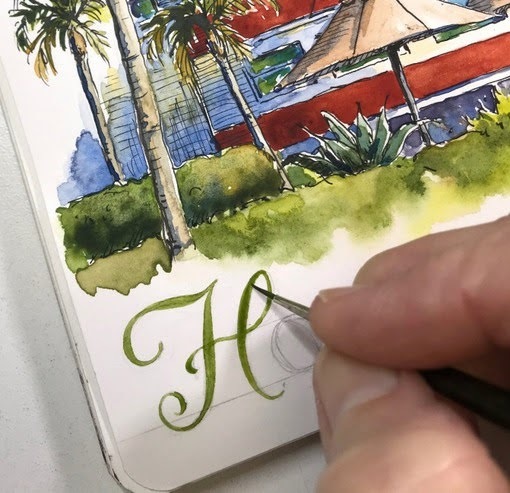 People liked how the green lettering almost became an extension of the foliage and acted as a subtle frame for the hotel sketch. I had to agree. It was a great choice, and one that surprised me, since my instinct had been to use a color that contrasted with the adjacent foliage. I had penciled in the lettering when I did the initial page layout. Now I picked up a #2 round Escoda Versatil brush and carefully painted over the pencil lines with olive green watercolor. Next I used a Duralar overlay to test some colors on the background behind the ice cream sundae. I decided to use a peachy color that was a combination of Permanent Rose and New Gamboge. I love how it settled out as it dried, separating into pinker tones where the paint application was heavier and yellow where it diffused into white. The color ties in nicely with the martini and the hotel roof. I added some handwritten text to the box after the background color had dried thoroughly, then inked and painted the other lettering on the page. I used a Pitt size S black pen for the lines, then painted over them with a paintbrush to add some color. 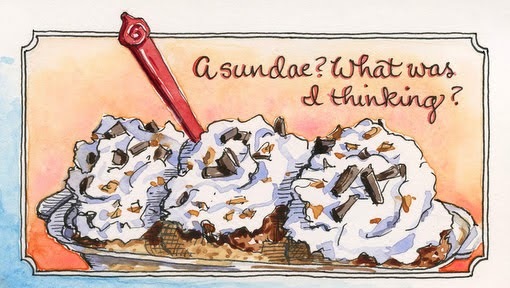 The last step was to decide whether to put color on the narrow border surrounding the ice cream sundae. After considering the options of "color" vs. "no color" and testing various colors using a sheet of Duralar, I decided it would look better with a border than without, and it seemed like terra cotta red was the way to go. 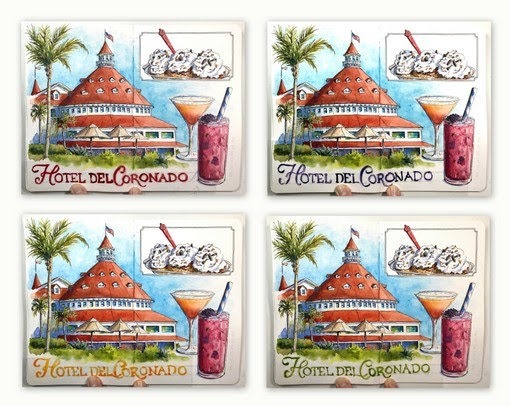 It coordinates with the peachy background color, the hotel, and the drinks. The sketch is finished, and I love it! I hope you enjoyed participating in the decision-making that went into this fun, colorful sketchbook page. Thanks for playing along! Love how it all came together! Thx for sharing decision making with us too. I have the impression that you are entering into advertising art. This colorful sketch certainly has that feeling...You certainly do have a variety of ventures with your art! 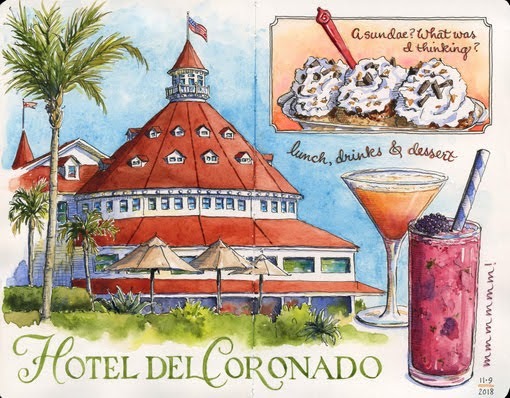 Hotel del Coronado Sketch - Opinions, Please!